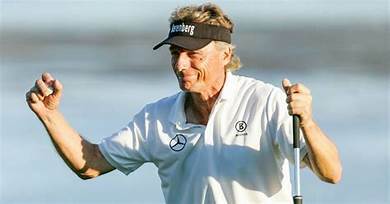 Bernhard Langer blew the Oasis field away for his 39h senior win. He’s unstoppable, unflappable and at age 61, he just keeps beating the pants off the over-50 set. Bernhard Langer got himself yet another Champions Tour win on a Sunday afternoon in Boca Raton, not far from his home. There was no doubt about this one, he sent an early message and by day’s end on the Old Course at Broken Sound, he had himself a five-shot victory at the Oasis Championship. In case you’re curious, that’s win number 39 for Bernie. Thirty-nine victories on the old guy tour, he’s sniffing distance from the all-time mark of Hale Irwin’s 45 senior wins. Langer gave a preview of the final round on Saturday afternoon when he was chasing Marco Dawson. He trailed Dawson most of the afternoon until he made eagle at the par five 18th to take a one-shot overnight lead. Any hopes Dawson had for victory were quickly squashed by Langer. All Langer did was birdie three of the first four then added another to make it four of the first six. Dawson and the rest of the field got the message in a hurry. The only question would be who might finish second in this one. The dominant player on the Champions Tour was his typical surgical self. He controlled his tee shots, hit greens and let his short game speak loudly. By the time he reached the 18th, Langer was 18-under, looking for the tournament record. He would get that too. Perfect drive, five-iron to 15 feet then a near eagle. His tap-in birdie made the final tally 19-under, one shot better than the 18-under record previously held by Michael Allen and Duffy Waldorf. Langer told how he put a bible verse on a piece of paper and put it in his bag. “Do not be anxious about anything…” was how it began, said Langer, a devout Christian. He never looked the least bit anxious. He was bogey-free and had only two for the 54 holes. He had no fives on his scorecard on Sunday. as he basically lapped the field, beating second-place Dawson by five shots. Along with healthy, he’s also become wealthy. The $255,000 first place money means he’s earned more money than anyone in the history of the Champions Tour. He’s been that and then some. I followed so much of Hales 50 and up career. Until this weekend I did not believe Langer would catch Hale, now it seems inevitable. Langer explained well the reasons for his success but keft out the most important one: hes the most serious about it. Its no secret the players loosen up a bit once they get to the 50 and over circuit, which many of them need. Not langer. Even Hale did his thing with a looser spirit. But not Langer. Langer quietly treats the champions tour like tiger treated the pga tour most of his career: with ruthless drive to dominate. And he does it with such grace. And most will tell you that Bernie is pretty deliberate…..knows his game, creates a plan and sticks to it….Bernie digs in and basically becomes the Doomsday Ball Striking Machine.